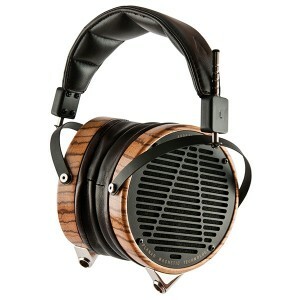 When we started designing the LCD-3 professional reference headphones, the goal was very clear, it must be the best. No compromise when it comes to the quality of sound. It provides the highest level of audio quality, unsurpassed bass extension, exceptional treble and the best mid-range.Innovations Every Day. Audez’e aspires to deliver extraordinary products through research. 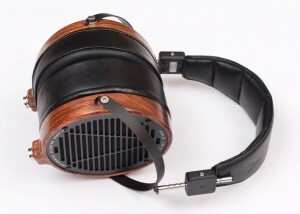 The LCD-3 is packed with many innovative technologies and new approaches. The all new LOTUS diaphragm that uses a special alloy for conductive traces gives us greater control, lower distortion. Translation – Music that sounds like original studio recordings. Overview Nothing matches the warmth and sheer luxury of natural wood. The Zebra Wood (Zebrano) with its intense color variation that ranges from light to dark complements the LCD-3s and was chosen specifically for its appearance. Very soft lambskin earpads that are gently sloped create a very realistic soundscape. The headphones come with both single ended and balanced cables and a choice of wood or travel carrying cases. Return Policy: You have 30 days to return the LCD-3. All items must be in new condition and the return results in a 15% restocking fee and the customer pays for return shipping charges. 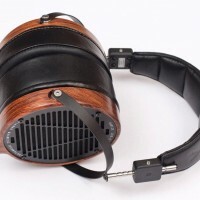 The LCD-2 is the state of the art Planar Magnetic Headphone from Audez’e Inc. Every component of the LCD-2 is precision engineered with one goal in mind: Recreate the sound exactly like the artist intended. LCD-2 combines leading edge technology and development with knowledge, feedback and suggestions from an on-going dialogue with Sound Engineers and Audiophiles. Transducer type: Dynamic. Operating principle: Semi-open. Planar Magnetic Transducers. Frequency response: 5 – 20khz, usable high frequency extension 50 KHz. Impedance: 60 Ω, nominal. Nominal SPL: 102 dB (1 mW / 500 Hz). T.H.D: < 1% at full output Maximum diaphragm excursion: 2.5mm p-p. Efficiency: 91 dB/1mW. Maximum output: 133dB, 15W. Custom designed Caribbean Rosewood earcups. Specially designed premium lamb skin leather earpads. Diaphragm excursion of 2.5 mm p-p for very high SPL. Maximum output exceeds 130 dB. Left and rear transducers have matched sensitivity and frequency response within +/- 0.5 dB. Specially designed self closing, acoustically transparent magnetic structure with highest grade Neodymium magnets. Large diaphragm area creates plane sound waves that enter ear canals the same way as it happens in real environment. Transducer active diaphragm area: 6.17 square inches. Input cable: Custom cable with mini XLR connectors. Contact pressure: 1.5 N. Weight: 550 g, without cable. Features: Semi-open design. Leather Headband. Frequency response graph of the particular LCD-2. Woodbox for storage. Wood Care kit.